Free online hexadragon curve generator. Just press a button and you'll get a hexadragon fractal. 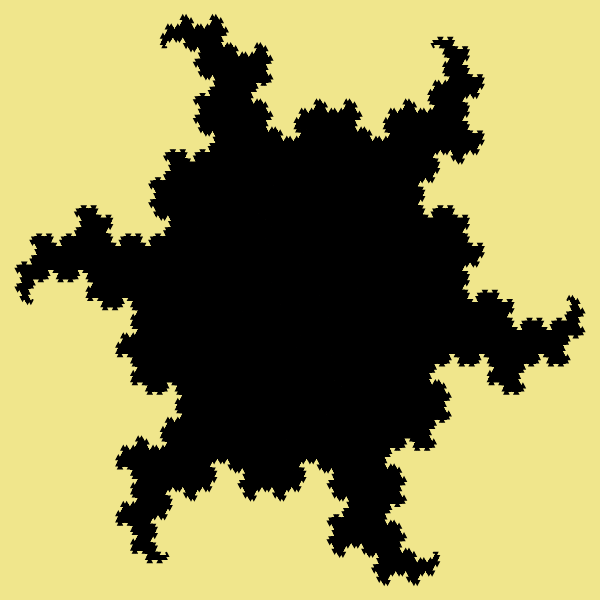 There are no ads, popups or nonsense, just an awesome hexdragon fractal generator. Press a button – get a hexdragon. Created by mathematicians for mathematicians. Iterations Recursive depth of the hexdragon. In the first iterations the lines that draw the dragons will be clearly visible but as the depth increases they will completely fill dragons with color. Center dragons Generate all dragons from one central point. Connect tails Draw a circle of dragons, connecting them with tails. Background Color of the canvas. Dragon 1 color Color of the 1st dragon line. Dragon 2 color Color of the 2nd dragon line. Dragon 3 color Color of the 3rd dragon line. Dragon 4 color Color of the 4th dragon line. Dragon 5 color Color of the 5th dragon line. Dragon 6 color Color of the 6th dragon line. Line Width Hexadragon curve line width. Padding Clear the space around the hexadragon. Select Direction Rotate six dragons in this direction. Hexadragon curve generator tool What is a hexadragon curve generator? 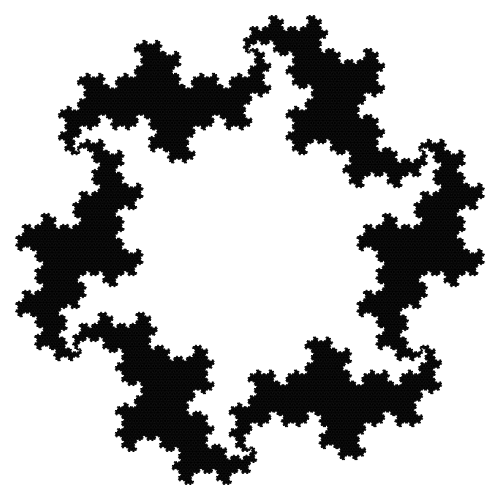 This tool draws a hexadragon fractal. 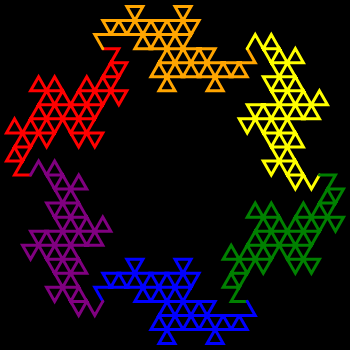 The hexdragon fractal is drawn from six terdragons. There are two ways to arrange them. In the first case, all dragons start from a center point and each one of them is rotated by 60 degrees. In the second case, each new terdragon is drawn from the tail of the previous one, also rotated by 60 degrees. For both cases we can adjust the size of the hexdragon curve and the number of steps of the iterations. We also have added an option to control color of each of the six dragons plus change the canvas color. Each dragon is drawn using a set of lines and you can adjust their thickness. 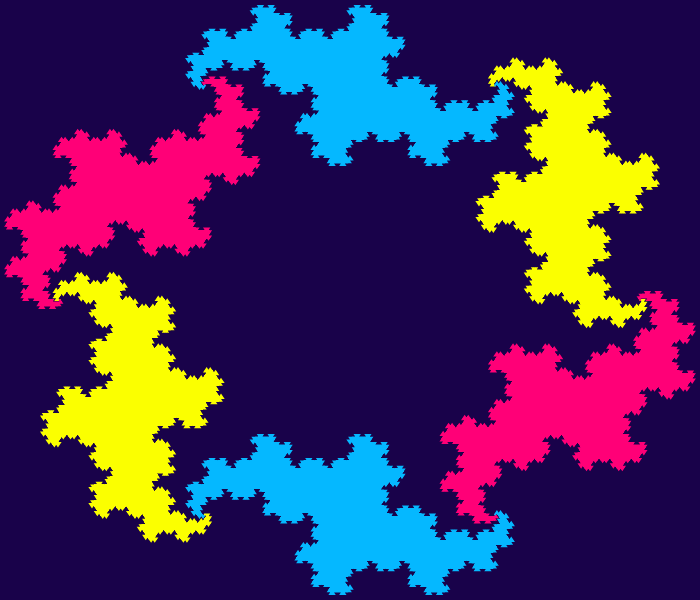 You can also all empty space around the fractal, and rotate six terdragons in four directions. Mathabulous! 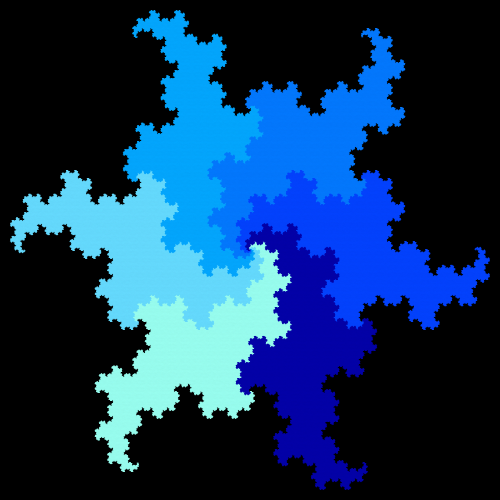 This example draws a hexdragon curve in six shades of blue, moving from light blue to dark blue color. All tetradragons start in one central point and we add 10 extra pixels around their tails so that they don't touch the frame of the fractal. We use 11 recursive iterations to generate the fractal and draw it on a 500x500 black background. This example generates a circle of dragons using rainbow colors. Here we're using only 5 iterations to draw the final fractal and we enable connect-tails option. As we're using line thickness of 3px we can clearly see how the dragons are made of individual line segments. Also a small space around a curve (5 pixels) is drawn for padding and the dimensions of the image are 350 by 350 pixels. In this example we use a single color for all six hexadragons. As a result we get a virus-like dragon fractal. The canvas size is 600x600px and we use a 9th order curve. This example makes dragon curves touch each other's tails. It uses the same colors for opposite dragons so we use only three colors (yellow, blue and bright pink) for six dragons. We set a 2-pixel line width, 5-pixel padding, and use 9 recursions on a rectangular canvas with size of 700x600px. This example draws a circular hexadragon but because it uses a single color for all of the dragons another hexadragon forms in the center. As a result you get two hexadragons total (six around and six inside).